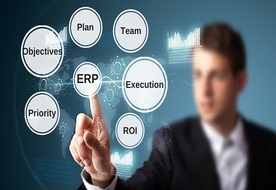 Enterprise Resource Planning or ERP has been around for 20 years now. Any business still using it has changed a lot since the early 1990’s. Has ERP kept up with today’s systems, or should we put it next to the rack of CD’s relegated to the spare room, replaced by new technology but a bit of a backstop just in case? Not any more–The new age business software is now much more ‘user-based’ and designed with user defined dashboards that each different user can adapt by opting in or out of the sections they need, giving a much more customized approach for all your members of staff. No more need for IT teams to set-up every user individually giving responsibility for functionality to the end-users themselves. The new cloud based systems mean that there is no longer a need to install expensive software onto individual machines, or to purchases licenses for users. Cloud computing means that smaller businesses can access a tailored solution that makes it affordable to be as efficient as the bigger corporations and benefit from smaller scale processes helping them to grow efficiently. These days, companies benefit from all staff being able to use the same system. Reports can be extracted from day to day working information, reducing the amount of unreliable forecasting and guesswork by managers. Users will be more efficient with access to up to date and real-time information, reducing errors, duplication and customer complaints that will aid the whole organization. The old style configurations where businesses had to fit as best they could and then employ people to customize sections of it are thankfully long gone. Today’s business software solutions come with a huge range of modules, processes and reports that have been designed around current industry standards and best practice, which can be configured to fit the individual needs of the business. The newest cloud-based systems don’t have the drawbacks of the old ‘on-site’ software that needed disruptive operating system changes and upgrades; these are all done for you keeping you online and on the ball. 5. Is it just for the Finance Managers? Business management can be much easier using an integrated system that incorporates all your departments and disciplines with a unified approach. But this will need buy-in from each department to benefit from the efficiencies this will provide. As soon as your Finance team spends time learning how to maneuver one of the new cloud-based systems; they will spend much less time consolidating departmental figures and creating penetrating reports. This will give your finance team a more decisive role to play in real-time management using more efficient information pathways and efficiencies from better information flows. So what are the key features of a cloud based business software? 1. Mobile Access: With more employees working remotely, business software has become truly mobile. Entering data and accessing information or reports, is all via the web. 2. Mobile support: Using Smartphone, tablet and laptop configurations, your sales, service and executive teams can communicate at any time. This means real-time views of activity and performance instead of last month’s. 3. Best practice configurations: Modern ERP im­plementations are now based on standardized indus­try best practices. You can still custom­ize the software but the base application will be much closer suited to your current business processes and structure. Hence, the emergence of 'Indus­try Clouds' such as RealWork from TIZE Inc which is exclusively created for the $800 billion Specialty Chemicals industry. 4. Cloud capabilities: It is fast becoming an industry standard to store data and applications in the cloud, to scale your software use up as well as down, depending on immediate needs and projects, without planning major organizational changes in advance. 5. Better ROI: A more adaptable approach will certainly increase your return on investment in three ways; reducing capital expenditure on hardware and software, delivering operational cost and efficiency gains, and transforming your business from a Monday to Friday 9 till 5, into an online 24-hour organization. The biggest benefits to all businesses of using a cloud based business software setup such as RealWork from TiZE Inc. are the usability and convenience for users who can access it from mobile devices wherever they are. No more waiting for information, being tied to the office computer, and no more risks of in-house server problems, upgrades and operating system downtimes. This is a perfect case of modern technology being able to save time, save money and even save businesses. If your current software systems are as outdated as the Starship Enterprise, perhaps it’s time to put it on your next boardroom agenda and have another look. Warp Factor nine Mr Sulu.